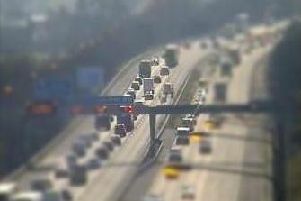 A collision involving a motorcycle has brought traffic to a standstill with all lanes blocked on the M6. The crash happened on the northbound carriageway between junction 23 near Haydock and junction 26 (Wigan, Orrell). Police and Highways England are at the scene. According to Highways England, the M6 is "fully blocked" due to a serious collision. Delays are building quickly on the approach as all four lanes remain closed. Highways expect the incident to be cleared between 12pm and 12.15pm. Traffic is at a standstill on the M6 northbound between J23 Haydock and J24 Ashton-in-Makerfield. Pic-Motorway Cameras.